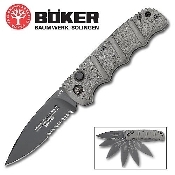 This innovative design comes direct from Boker's line of Magnum knives. The 3 1/4" blades are based on the bayonet of the AK-74 rifle and are constructed of AUS-8 stainless steel. Structured finger grooves on the aluminum handles provide a secure grip. Spring loaded push button open.